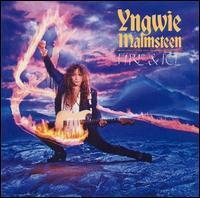 Yngwie Malmsteen Releases "Fire and Ice"
Fire & Ice is an album by Yngwie J. Malmsteen, released in 1992. Yngwie Malmsteen left Polydor records in the 1990/1991 season, signing a new contract with Elektra/WEA Entertainment in 1991. As a result, this album was poorly promoted by the record label, whose corporate officers were engaged in a boardroom war to choose a leader of the company that did not end until mid-1994. The label from 1991-1993 was chaired by Bob Krasnow, Anita Baker, and Natalie Cole, thus making the label very chaotic. When a final leader, Sylvia Rhone, was chosen, she set out to remove all 80's bands from the label by bankrupting them, thus hurting Malmsteen's career. The album was to be Malmsteen's last major commercial outing. It was his third and last attempt (starting with 1988's Odyssey on Polydor) at scoring a hit album with late 80's/early 90's American hairspray audience. The album was awkward, featuring a keyboard-driven single in a post-Nirvana '90s world. The album, apart from the song "Teaser", however, was more closely rooted in neo-classical metal than any album he'd done since 1986's Trilogy (also on Polydor). It featured three stunning neo-classical instrumentals, as well as several good neo-classical metal pieces. Being a more commercial album, it featured bright, clear production as well, which is still credited by fans to this day. The album did fail to achieve gold status in the U.S., although it has been certified 3x platinum in Japan, where Malmsteen continues to sell out huge venues today. Part of this can be blamed on the lack of promotion by then-label president Anita Baker, who was more concerned with resigning Anthrax to the label at the time. The other factor to consider is the rise of grunge, which destroyed the remnants of eighties metal, Malmsteen's sales included. By '92, Nirvana was the top new American rock band, and they, for the most part, completely eradicated shred guitar's mainstream fanbase in America.